Cubic Zirconia (CZ) Celtic Bridal Set : LOVE2HAVE in the UK! A 9ct white gold cubic zirconia (or CZ) Celtic bridal set. Cubic zirconia is the ultimate alternative to a costly diamond Celtic ring which can cost up to five times the amount. That is a MASSIVE SAVING! 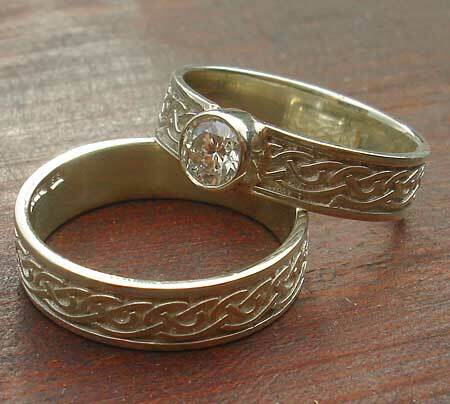 Both of these lovely white gold Celtic rings are available to buy separately on our website but here is your chance to save a massive amount of money if you happen to be looking for a Celtic bridal set. 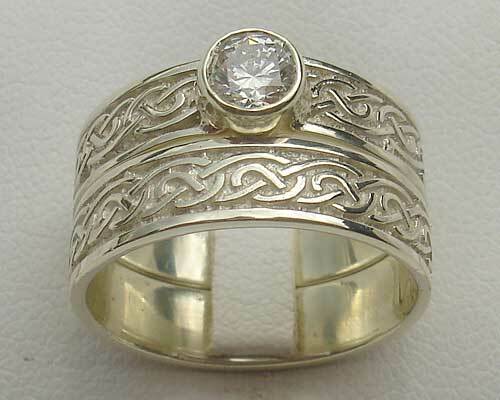 The plain ring is the Scottish Celtic knot wedding ring, a traditional Celtic wedding ring. The designer has informed us that the actual Knotwork for this ring comes based on some real Celtic treasure unearthed on the Scottish Isles during the 1950's. The width of this ring is approximately 5mm, and the handmade Celtic knot design goes all the way around the band signifying the Celtic never-ending line of life. The engagement ring is a traditional Scottish Celtic engagement ring shown here in 9ct white gold and set with a cubic zirconia (or CZ) stone that sparkles. The Celtic knot pattern features around the entire outer of the ring symbolising the never ending in the Celtic language. The ring measures approximately 5mm wide and the CZ stone 4.8mm in diameter. This bridal set is also available in red garnet, purple amethyst and a white diamond as well as 9ct yellow gold also, so if you are interested in any of these options, then please do email us and we will let you know more. These designs make an excellent choice for matching wedding rings, and we can even offer you a further discount too if you were to buy another plain ring as the ring for him. Model: CELTIC BRIDAL SET R120/1CZ. Precious stone(s) Available: 1 x 4.8mm CZ stone. Returns Policy: This Scottish made Celtic bridal set is made to order so, therefore, non-returnable unless faulty or not as described. Please see our terms and conditions.